Brandeis University Press, 9781611686050, 260pp. The Jewish High Holidays—the ten days beginning with the New Year Festival of Rosh Hashanah and culminating with Yom Kippur, the Day of Atonement—constitute the most sacred period of the Jewish year. During this season, religious as well as nonaffiliated Jews attend synagogue services in unparalleled numbers. Yet much of what they find there can be unwelcoming in its patriarchal imagery, leaving many worshipers unsatisfied. For those seeking to connect more deeply with their Judaism, and for all readers in search of a contemplative approach to the themes of the fall season, poet and scholar Marcia Falk re-creates the holidays’ key prayers and rituals from an inclusive perspective. Among the offerings in The Days Between are Hebrew and English blessings for festive meals, prayers for synagogue services, and poems and meditations for quiet reflection. 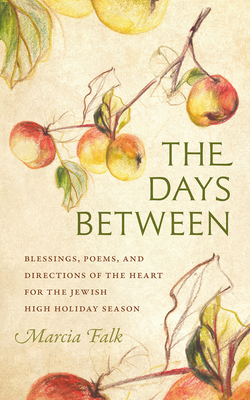 Emphasizing introspection as well as relationship to others, Falk evokes her vision of the High Holidays as “ten days of striving to keep the heart open to change.” Accessible and welcoming to modern readers, The Days Between is steeped in traditional sources and grounded in liturgical and biblical scholarship. It will serve as a meaningful alternative or supplement to the traditional liturgy for individuals, families, synagogues, and communities small and large—that is, for all who seek fresh meaning in the High Holidays. MARCIA FALK, a Brandeis University alumna, is the author of three books of poems and several highly acclaimed translations of biblical and modern poetry, including The Song of Songs: Love Lyrics from the Bible. The Days Between is the long-awaited sequel to her groundbreaking liturgical work, The Book of Blessings: New Jewish Prayers for Daily Life, the Sabbath, and the New Moon Festival.